This area lies south of the I-70 corridor and has at least a smattering of ice that might be best considered local ice rather than destination ice. However, for the curious, like me, there is some information. Multiple encounters with ice climbers in Vail and at Lincoln hinted at some ice of low-end difficulty near Leadville called Chalk Creek. Yet, it seems it's well-known enough to attract CMC classes. This one I've confirmed. Whispers of ice on private land in the Climax mine are out there. 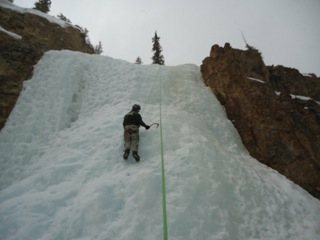 A conversation with another ice climber has me wanting to search out Belford Falls ice. 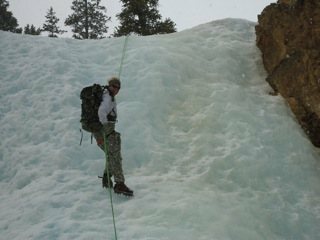 Other information suggests possible multi-pitch ice on the north face of Quandary Peak. Then, a bit of ice on Belford. Some ice drainages (including the fickle Sword of Damocles) on Mt. Antero and Mt. Princeton. Probably, this brief list is just a start for those with the inclination to wander or the cognoscetti. The town of Leadville probably serves as the destination for food, drinks, B&Bs, hot tubs, and other amenities, if not the home for those who climb in this area. Most of the climbs are probably best described from Leadville. There are climbs to the north of Leadville off of CO 91 or south of Leadville off of US Hwy 24. This is the principal road in the area. This area lies to the south of Copper Mountain Ski Resort and I-70. If you are going through Leadville & need coffee, bakery goods, or wireless internet, the Provin' Grounds Coffee Shop (508 Main St.) may have what you need. Juggler busting some CO ice! Nice Fat Ice!